Lord Laming, the head of the inquiry into Victoria Climbie's murder, has called for "utter determination" and "co-ordination" to protect children. In a message to the last memorial event on the 10th anniversary of her murder he said "agencies must work together". 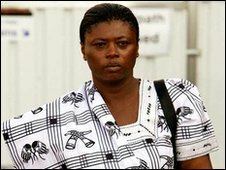 Her mother, Berthe Climbie, described her as a "star" who would "dispel the diabolic tortures towards children". 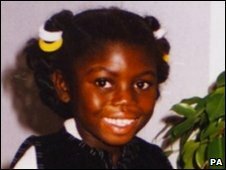 The eight-year-old died in 2000 after being tortured for months by her great-aunt and her partner in north London. The Victoria Climbie Foundation (VCF) marked the anniversary with the memorial event at Parliament's Portcullis House in Westminster. Victoria died on 25 February from malnutrition and had 128 separate injuries at the time of her death. Her great-aunt Marie Therese Kouao and her boyfriend Carl Manning of Haringey, north London, were jailed for life for her murder. Victoria had been seen by dozens of social workers, doctors and police officers but they failed to spot the abuse. A message from Lord Laming said: "Where children at risk are known, agencies must work together in a co-ordinated way to protect them. "There is good practice around the country, but we all have to work with utter determination to make good practice standard practice everywhere," he said. Mrs Climbie said of her daughter: "This star must remain bright to dispel the diabolic tortures towards children. "We must do whatever it takes to protect and safeguard them." The director of the VCF, Mor Dioum, said it was time to "truly put her legacy into practice". He also called for serious case reviews to be published in full, citing recent cases of the death of Baby P - Peter Connelly - who, like Victoria, was known to Haringey Council - and the brothers who were tortured by two young boys in Edlington, South Yorkshire. "We seek full disclosure of such reports to find out what has happened and whether there are similarities to other cases," he said. Shadow children's minister Tim Loughton also backed the call saying: "Public confidence cannot possibly be restored without full publication." Under current rules the detailed findings of the reviews are confidential and only a summary is published which Mr Loughton said "clearly limits the opportunities for authorities to learn from each other's mistakes". But the government has rejected the argument, saying it could put vulnerable children and their families at greater risk, as well as making people more reluctant to take part in child abuse investigations.